A pair of antique Wedgwood black basalt wine and water ewers named: "Sacred to Bacchus" and Sacred to Neptune". These are distinctive sculptures. Placed where there is space to view them from different angles the viewer sees a true work of art. The wine ewer is modeled with Bacchus sitting atop the shoulder of the urn. He wraps his arms around the spout holding the horns of a ram's head. This ewer is further decorated with fruiting grapevines descending along each side. The water ewer is modeled with a figure of Neptune sitting atop the shoulder. He wraps his arms around the spout holding the horns of a sea monster. This ewer is further decorated with festoons of seaweed descending along each side. The modeling is very crisp. Models of the ewers were originally supplied to the Wedgwood factory by John Flaxman Sr, plaster cast and model maker, in 1775, but the original designs were probably copied or cast from models by Clodion. Both ewers in the pair are impressed with the Wedgwood mark. Dimensions: 17 inches tall x 6.5 inches diameter at the widest point x 4.5 inches across the square base Condition: Excellent Price: $14,800 Background of Clodion Claude Michel Clodion (1738-1814) was a contemporary of Josiah Wedgwood and his forms were often emulated by ceramic manufacturers. The wine and water ewers have appeared in various Wedgwood ceramic bodies including black basalt, jasper, Queen's Ware, gilded bone china and even in majolica. Large vase in black basalt, in the ancient Greek shape used for a water vessel called a Hydria. A large pair of vases in the Lebes Gamikos shape, in undecorated black basalt. A classic form that would suit period or contemporary décor. An early basalt vase, decorated with a medallion of Hercules and Antaeus, cut into the wreath and berry band. Marked Wedgwood & Bentley. 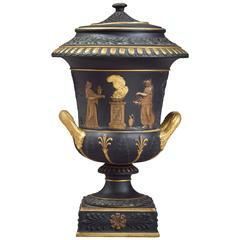 A wedgwood black and gilt basalt covered Potpourri vase, circa 1870.